Boom, this one is huge. I like it a lot though. For me pacing is again very relevant here. Really pace your self on the rower, come off fresh not fatigued and blowing as you will gain maybe 20 seconds on the rower but loose over a minute on toes to bar. This workout is going to be about grip management. Your grip will be gone, no doubt so push it till it burns a little then rest. You may find staying away from failure on your toes to bar is the best option, so sets of 10-8-5-3-3-3…. Once your off the rower stop pacing, there is no way you will get to the muscle ups with fresh shoulders following all the previous reps of toes to bar and cleans. So just work hard to get through these, the guys who did the opening workout broke on wall balls and did every clean as a single. This is because they were fast on the toes to bar, Most people will not be, so no excuses. try not to break on the wall balls & at the very least do the cleans in pairs, as this will save you at least 30 seconds. Fine break the last 5 to 10 into singles so your shoulders and grip has a rest but push it up until there. Muscle ups, your are going to need to preserve your shoulders as much as possible on these. So don’t go for muscling through on the early reps as you will have nothing left. Big hip drive from the off. Back on the rower, Run to the rower, push hard to get it moving ASAP and give this everything you’ve got. Tapping, tape your hands and thumbs. I’ve heard olympic lifting shoes recommended? I don’t. They don’t feel good on a rower and they don’t feel good in the air. 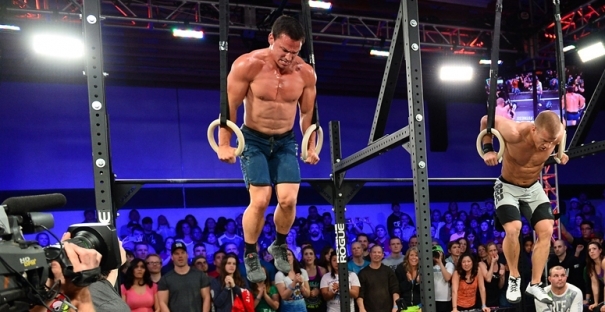 The herd work in this wod is feeling light in the air.